Structured markup language is a unique digital language that website builders can add within a website’s back end code. It allows search engines like Google to locate information that is contained on each web page much easier through a standardized format. Google can read this information in a web page’s code and better classify the page’s content, including what exactly is on the page. For example, lists, prices, ingredients, calorie amounts, cooking temperatures and even votes and ratings can be easily detected. 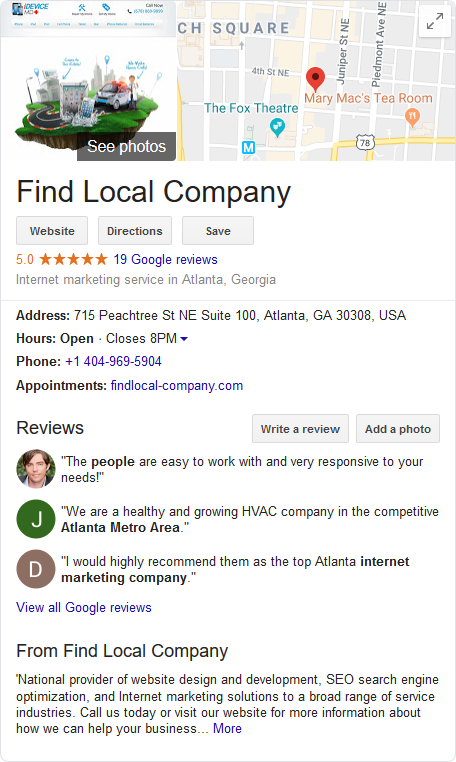 This information, in turn, is shown in search engine result pages as “rich snippets,” or extra bits of content that make for richer search results. More data can be collected from the search result before visiting the actual page, enabling users to quickly locate relevant websites. Google and other search engines can display more relevant search results. Search engine users are provided more specific information about search results, enabling them to locate the most relevant sites quicker than ever before. Websites enjoy more click-throughs and lower bounce rates because users only click onto websites that are highly relevant to their search. Find Local Company website builders are experts at using structured markup language within your business website’s internal coding. That means the resulting rich snippets of information show up in your website results in Google and other search engines. Detailed, structured markup language within your website’s coding produces rich snippets for the search engines to detect. This provides more information for search engine users when your website pages appear on a results page. When more information is provided to the user on the search page, they can make a more informed decision about which site would best provide what they seek. Businesses and Organizations – Including business name, physical address, website address, phone numbers, geodata and company logo. Events – Including beginning and ending date, length, ticket availability and pricing and geolocation. Music – Including links to song previews and direct links for purchasing tracks or collections. People – Including staff and team member profiles for your business from LinkedIn. Products – Including name, images, brand, description, quantity in stock, price, seller, product condition and identifiers (ISBN, SKU) special offers and reviews. Recipes – Includes everything from the type of dish, reviews, and preparation and cooking time, to nutritional information such as serving size, calories, fat content and more. Reviews – If your site supports product or other reviews. Video Content – This is information about embedded video content on your website and includes video length, license, video creator and content ratings. Find Local Company website builders include this extra data in structured markup language. This is so your website results display the greatest amount of relevant information possible for search engine users. Using structured markup language in your website’s backend coding is just one of the ways Find Local Company goes the extra mile for you. In addition to our unique page-by-page keyword research and optimization, we include this coding in order to make your webpage information stand out on search engine result pages. Not every website development company uses structured markup language in their website construction process. We do it to add that extra means for Google to detect your website content and display it in a better way for users. Search engine users get a clearer picture of what is contained on your website and can make better decisions about choosing your site. Could your business benefit from an uber-optimized website that includes structured markup language as an added SEO benefit? Call or contact Find Local Company online for more information.